The weekend is here and I wanted to have a little fun. 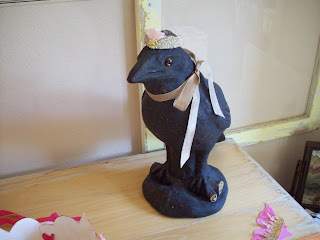 I bought this lovely raven awhile back from Garden Memories. I set her on the edge of my work table. She watches over my crowns, and keeps me company while I work. Here is the problem, I think she needs a name. 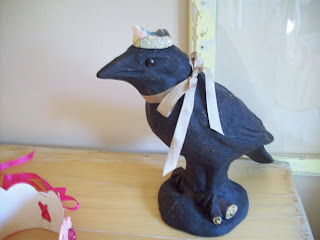 I made her a crown of course, but the poor bird doesn't have her proper mascot name. 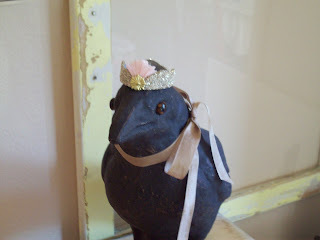 So if any of you can come up with a fantastic raven mascot name please leave it in the comments. Next Friday Feb 6, I will choose the winning name. Be creative!! There will be a prize of course. 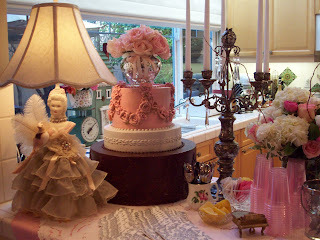 Not sure what it is yet, but probably something from my Marie Antoinette collection. 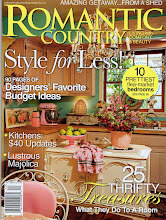 Please pass on the contest to all of blogland. Who doesn't love a contest with a prize? Have a great weekend! Enjoy the Super Bowl if that is your thing! PS, I know she isn't a real bird, just having fun!! Hope you had a nice weekend, and are having a great week so far. 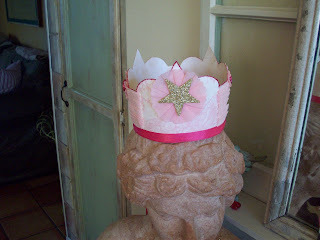 Here is a new little pink and white crown I made for my etsy shop. 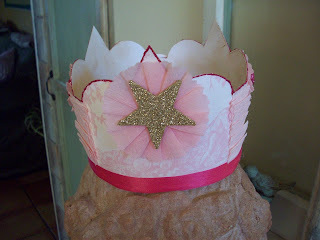 I am working on some crowns for a cupcake shop in town. Thought you might like to see it too. 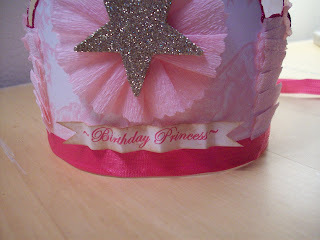 All of my crowns can be made to say whatever the customer wants. This one happens to say Birthday Princess. Might be nice for the cupcake shop. 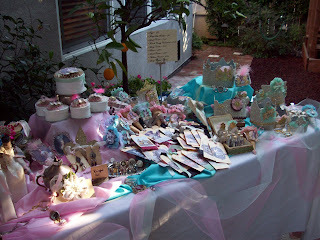 Our new cupcake shop is called Cupcakery Cupcake Bakery and Boutique. Isn't that a cute name? They are the sweetest mother and daughter team. They use the freshest and best ingredients! Yummy!! So far I have tried the lemon and the carrot cake. Makes you want to eat a cupcake doesn't it? I only eat half. I share with my husband. Believe me, it's a nice treat once in awhile. Enjoy your week, whatever you may be doing. I have been really busy this last week. 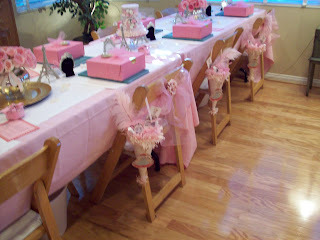 After the Marie Soiree, I had to work on a big order, and now some smaller orders. I thought I would show you the pretty window I bought from Garden Memories. The store is closing, there isn't much left, but this had my name on it. I have seen it, and admired it for years in the shop. Now it's hanging over my sofa in my family room/kitchen area. 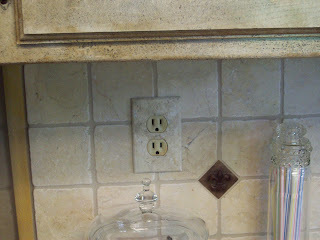 It goes quite well with my wall color, and new kitchen remodel. I have been checking the blogs, just not always time for comments. I hope to chat with you all soon. Saturday was a great day!!! 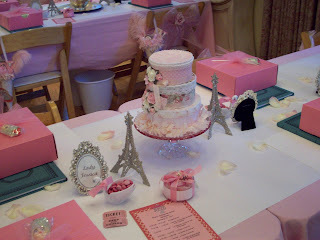 It was the Marie Antoinette Workshop and Soiree, hosted by the lovely and talented Kim Caldwell of Artistic Bliss!! It was a beautifully executed day of art, crafting, food, fun and of course shopping. Kim leaves nothing undone as you can see from the pictures. She is such a sweet, and wonderful hostess! 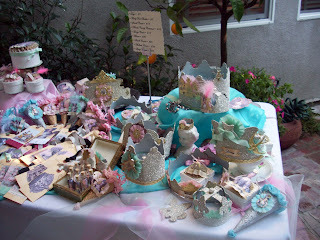 As you can see, I shared a table with my friend Jamie of Simply Me Art. 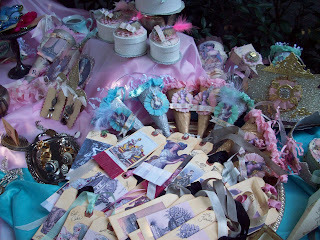 We had such fun setting up our wares. Her jewelry and my paper art complemented each other perfectly. Jamie and I always have fun together. Her jewelry is beautiful, and everyone loved it. Another fun thing was meeting all of the ladies. Fellow bloggers, artists, and just all around nice friendly women! It's also great when other women are so enthusiastic about the art that you do. I want to thank Kim, for hosting such a great day, and Jamie for being such a good friend. Also to all of the ladies I met and made friends with. It's so great to share ideas with women that have the same interests. 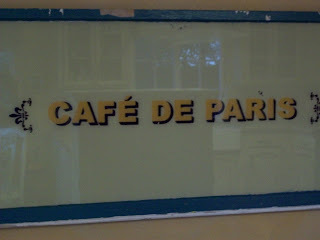 I hope you enjoy the photos. I would have taken more, but in that environment you tend to get distracted by all of the eye candy. 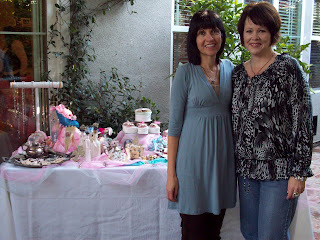 PS, I forgot to mention that the talented Candice Carpenter taught the beautiful Marie Craft to the ladies. She is amazing and talented!!! 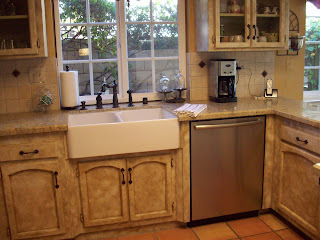 My kitchen is a done deal, except for molding around the window, and scrubbing and resealing my floor. Other than that it's done!!! I love, love it. 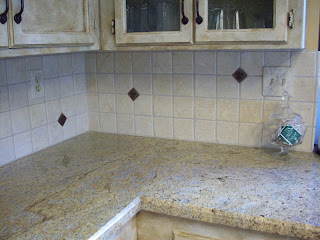 The back splash turned out so good! It's so nice to be back in my kitchen. I am just starting to put things back. 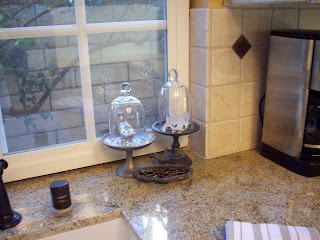 I decided to have clear glass apothecary type jars so I can see the pretty back splash. 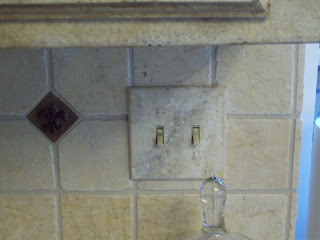 I wanted to point out the switch plates that I painted to match the tumbled stone. They were just the cheap plastic kind until I got my hands on them. 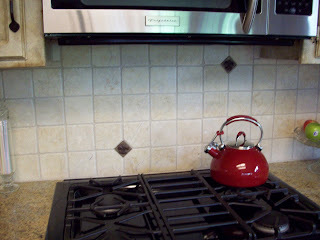 The little metal 2X2 tiles here there were hand made in South Dakota. I think they really make the look. We used 9 of them through out the kitchen. I hope you enjoy seeing the finished project. 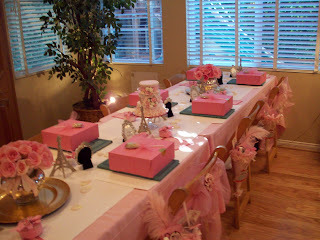 Now onto the Marie Soiree! Just wanted to post a little kitchen update. 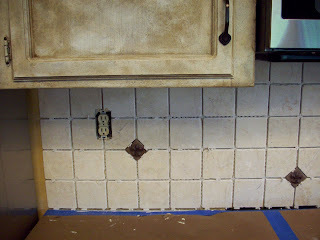 The back splash got started yesterday, and will be finished later today. 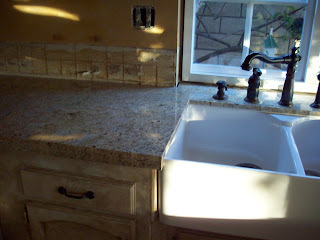 I posted before back splash, and after. 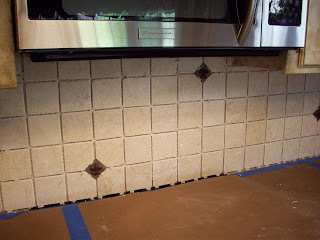 Today will be sealing and grouting. 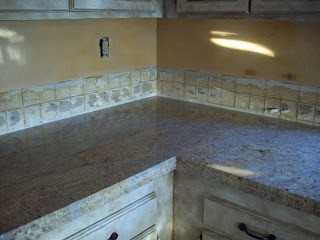 Will post more pictures of the finished kitchen soon. 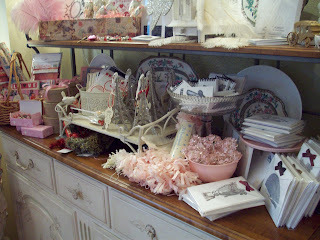 Ventura shop update, I pulled the rest of my pieces out of Garden Memories on Saturday, as the shop will be closing shortly. 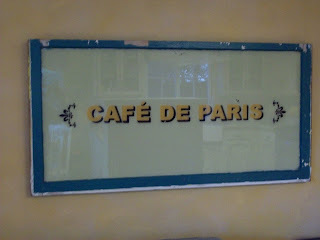 Very sad, but the owner Barbara is sort of retiring, and sort of trying some new things. Good luck Barbara!! 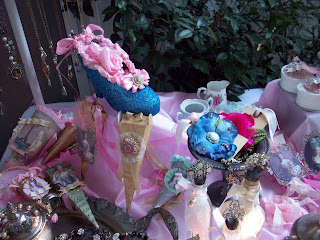 I am busy working on Marie Antoinette pieces this week. I will be posting about that soon. 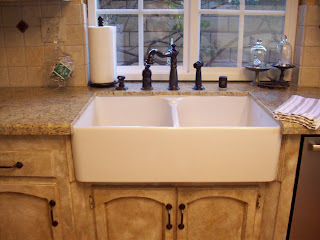 ps, sorry the pictures are after then before back splash! !